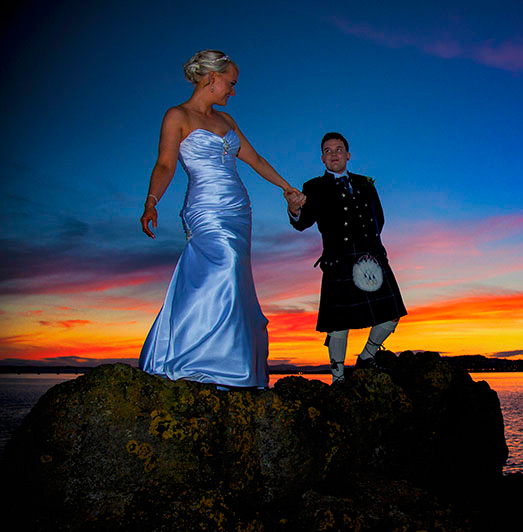 Relative Portraits provides quality affordable wedding photography to clients throughout Scotland, providing creative, contemporary, sensitive, romantic photography for the special day. All our weddings come with 2 photographers as standard to ensure we capture as much of your day as we can. Our pricing is fully inclusive and we provide a free wedding photography consultation meeting without asking you to sign a thing, we offer Secure online albums for all weddings so you may share your photo's with friends and family. On the day you are presented with a signing book for your wedding guests to sign with images from your free pre-wedding shoot throughout. Creative, stylish, beautiful, stunning, thoughtful and evocative are words clients have described our photography. The approach to people photography is sensitive, quiet, discreet and gentle - capturing the beauty of human emotion, and your expressions. This friendly approach is the same whether it's for weddings, portraits, glamour, boudoir, maternity, fashion or events. Using a combination of reportage photography as a quiet background observer, to a directed, posed and carefully choreographed at key moments session. We Provide clients with a unique blend of styles to create a truly unique and beautiful series of images. On a wedding, they keep things simple and relaxed, capturing the special day as in unfolds, quietly recording the beauty of the event. Relative Portraits provides wedding, portrait, maternity, baby, pet, product, event and corporate photography for very affordable prices.